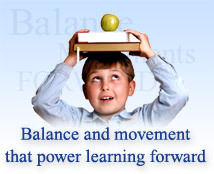 Balance is a crucial and central component of the Learning Breakthrough Program™. In order to understand why the program focuses so much on balance stimulation, the central role played by the sense of balance (vestibular system) must be thoroughly understood. As a baby grows in the womb, the vestibular system is the first sense to develop, and serves as an critical, common organizational tool around which other brain processes then develop. Because the vestibular system combines the inertial information from the three semi-circular canals with the gravitational orientation provided by the otolith organ, it is the basis of our inertial gravitational model of the world—that is, our model of the world as a three-dimensional space with a clear sense of up and down. As a child continues to develop in the womb, the other major brain systems (motor, tactile, auditory and visual) also develop, but they develop in relation to the vestibular system, or sense of balance. Since the vestibular system plays such a key role in the foundation of perceptual abilities, balance problems can cause many, seemingly unrelated, problems in brain function. Click here to learn how the Learning Breakthrough Program™ can address a wide range learning difficulty symptoms by working to improve this basic building block of brain function.